Has your cat's water intake pattern changed? Does it worry you that he hasn't had a drink today? With a cat's body estimated to contain 80% water, constant monitoring should be carried out to ensure your cat is drinking enough. Contrary to common belief, even though you hardly catch him taking a drink, he is just as vulnerable to effects of dehydration as the rest of us. Ranked second , most essential life sustaining nutrient, water loss in your pet's body needs to be managed. It is important that your has a balanced diet. Meals consumed provide your pet with a constant supply of nutrients and energy. These nutrients are carried throughout your cat's body by blood. Adequate oxygen is also transported to vital body organs via blood cells. Equally significant is the removal of waste from the body. Nitroge﻿n﻿﻿ and other toxic elements are commonly excreted in form of urine. All this requires your pet to have enough blood. The main constituent of blood is water. As such, sufficient water must be added to your cat's diet. 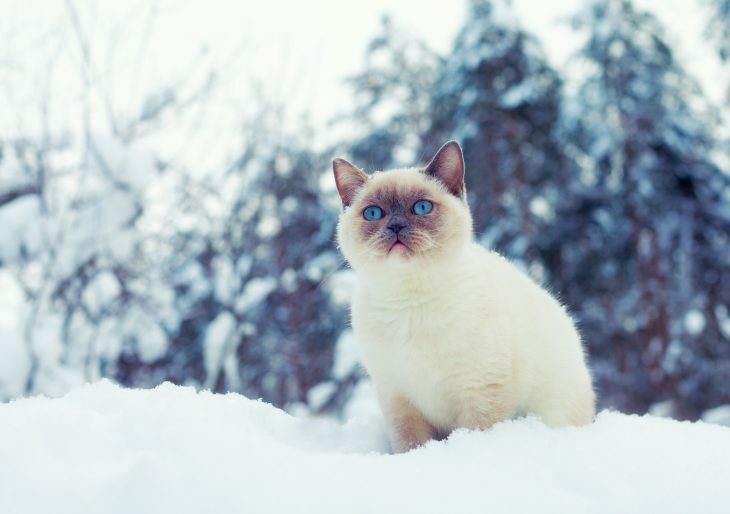 Cats are resilient in managing extreme temperatures. With a normal temperature range of 100.5 to 102.5 degrees, your pet is more tolerant to high temperatures than you. However, when temperatures go too high, it is more likely that dehydration will set in. Other than finding a cool spot and reducing activity, cats will seek water to drink. Additionally, cats, like us, need water to produce sweat. Unlike us however, they do not sweat through all their skin pores. Instead, they sweat through their paws and noses. As the sweat evaporates from these surfaces, some of the heat dissipates, making sweat an essential part of temperature regulation. Starting with addition of saliva in the mouth, to breakdown of food by acids, water plays an essential part in formation of these bodily liquids. A well hydrated cat is further capable of secreting mucous in its stomach in preparation of food breakdown. The mucous layer formed helps protect the cat's stomach lining from effects of acid as food is digested. Without this protection, a gastroduodenal (stomach) or duodenum (small intestine) ulcer would begin to form. Also, water ensures that stomach acid is at the correct pH level. If your cat experiences dehydration, its body would not be able to produce enough acid to break down food. This in turn deters passage of food to the small intestine, leading to abdominal discomfort. In the small intestine, digestive bacteria are also unable to digest food properly as pancreatic enzymes and bile are not released to usable levels. This results to inefficient absorption of nutrients. Other than roles discussed above, moisturizing of body organs, moisturizing joints, improving metabolism, among others too many to enumerate, are additional functions of water. It is therefore clear that water serves as a cornerstone nutrient for a fully functioning body. 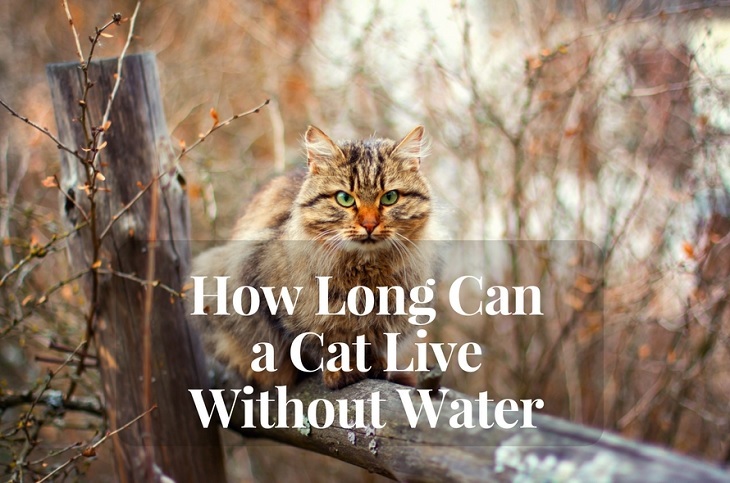 In comparison, diseased cats can go longer or shorter durations without water than their healthy counterparts. Depending on illness, a cat's drinking habits would have a noticeable change. Cats that acquire diabetes, kidney or urinary tract infections, will require a drink of water more frequently. On the other hand, those that acquire liver or respiratory diseases would drink less amounts than before. Even when not ailing from diseases, factor such as pregnancy or nursing, may induce stress on your pet. Stressed pets go longer without water. As cats age, there is a reduction in body mass. This implies that less water is required for an older cat. However, breeds that retain a greater mass even with advancement of age, would have greater water needs.In relation to age, activity also determines your cat's drinking requirements. 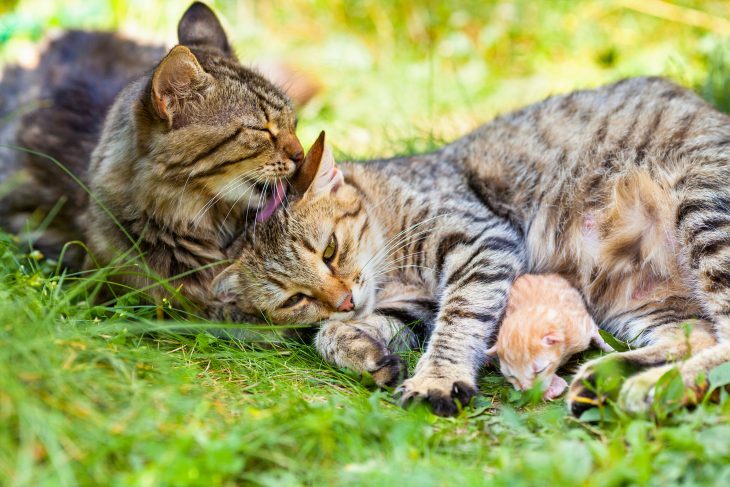 Younger, more active cats require water more often and in greater quantities than older, torpid pets. Dry air and temperature changes, alter your pet's drinking frquency. Temperatures of between 50-60 degrees hardly alter drinking patterns. On increasing, more water would be required for efficient functioning of the pet's body. Intrestingly, low temperatures also increase water intake demands, so as to warm up. Cats that rely on raw or unprocessed meals, require the least amount of water when compared to those that eat canned or dry fo﻿ods. Pets feeding on dry foods﻿ would be the most affected. They may require up to 10 times more water. 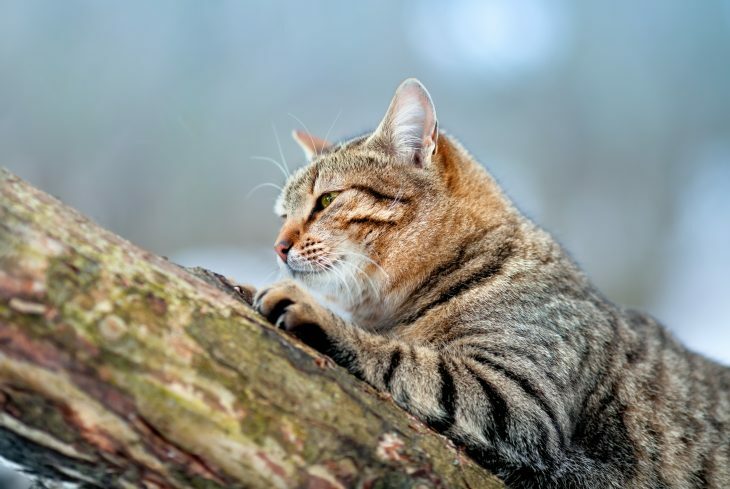 Foraging cats may not drink as much. From what they catch, they are able to meet their daily hydration needs. It is still important however to provide water nonetheless. Pale gums and / or dry mouth. Reduced skin elasticity (Skin does not return quickly to its prior position after a lift). Older cats are more prone to getting diabetes. 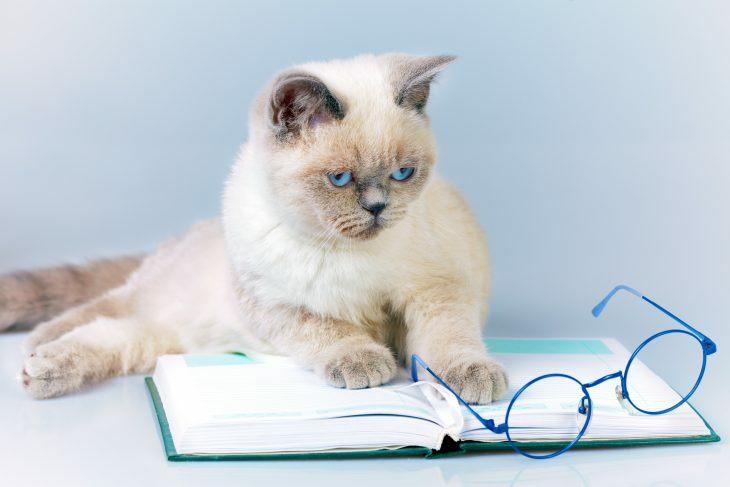 Characterized by frequent urination, a diabetic cat will require more water intake. 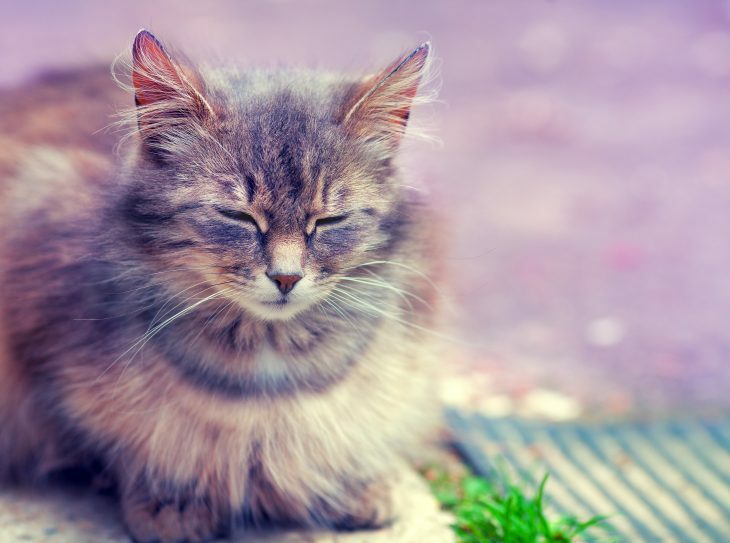 As sugar increases in a diabetic cat's blood stream, it overflows into its urine, causing it to urinate more. When kidneys fail, your cat will pass urine more and therefore require water just as frequently. Accompanied by symptoms such as increased appetite and hair loss, increased water intake may also point to hyperthyroidism. This is a condition where thyroid glands release thyroid at an excessive rate. As you have probably noted with your pet, cats will drink from the most outrageous places. Some cats have a problem in seeing still water and therefore will drink from puddles, ponds and such. In such cases, pet owners can invest in a cat drinking fountain. In short, it is recommended that cats have access to 150ml of wate r each day. Always make sure that your pet has access to safe and clean water. Not only is clean water good for your pet's health, but it also encourages your pet to take a drink more often. In any case, even though cat's urinary tracts are very efficient, changes in drinkingpatterns over a period of time, can be further looked into by visiting avet.